Ayman Al-Zawahiri, Osama bin Laden, Gilles Kepel et al. In the past our politicians offered us dreams of a better world. Now they promise to protect us from nightmares. The most frightening of these is the threat of an international terror network. But just as the dreams were not true, neither are these nightmares. In this series, filmmaker Adam Curtis explores how the idea that we are threatened by a hidden and organized terrorist network is an illusion.It is a myth that has spread unquestioned through politics, the security services and the international media. At the heart of the story are two groups: the American neo-conservatives and the radical Islamists. Together they created today's nightmare vision of an organized terror network, a fantasy that politicians then found restored their power and authority in a disillusioned age. Those with the darkest fears became the most powerful. features This DVD contains the complete three-part series first broadcase on BBC TV in 2004: 1, Baby It's Cold Outside. 2, The Phantom Victory. 3, Shadows in a Cave. 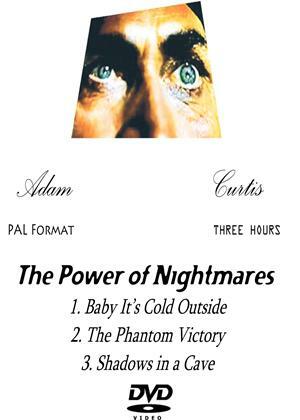 Adam Curtis is also the Director of The Century of the Self and The Trap. Standard packaging is small round plastic "Clamshell" case.